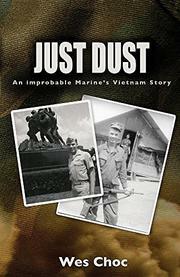 An author details his varied duties as a Marine during the Vietnam War in this debut memoir. Despite possessing personal frailties and lacking a clear notion of intent, 21-year-old Choc enlisted in the Marines in fall 1965. Underweight and proficient in typing, he followed the administrative route and ended up in Vietnam as a typist, radioman, mailman, and aide-de-camp to his company’s commanding officer. He was stationed on Hill 55, a popular stop for celebrities like Jayne Mansfield and John Steinbeck looking for in-country photo ops. Despite the alleged safety of Hill 55 and his supposed noncombat duties, Choc experienced his share of pot shots, barrages, and proximity to death. “There must be libraries of war stories out there,” writes Choc as he prepares to submit his to the genre. A bombardment at Khe Sanh—which he mostly slept through, to the extent that when he awoke there was a brand new hole in his roof—decimated a tent mere yards from his and “seared second platoon flesh and bones with cumin spice and deadly bloody condiments tossed randomly about.” One of the author’s more gruesome jobs was to help identify the bodies of those killed in action, as he was one of the few people who, due to his mail delivery duties, knew what everyone looked like. Choc’s prose is ornate and tends toward the literary, though this sometimes leads to awkward syntax that trips up the reader: “Choices were considered amid anxieties of the unknown and hours of deliberation.” The writing flows better and hits harder when the author keeps it simple and direct: “Southeast Asia was a stewpot of wrath, brute will, and confusion.” While much of the book is concerned with his Marine experiences before and after the war, it is the Vietnam section that is the most salient and compelling. There is a bit of Yossarian in Choc’s gun-shy administrator, who inevitably finds violence even as he seeks to avoid it. Fans of Vietnam memoirs should enjoy this more cerebral take on that war and the military of the era. A philosophical, anecdotal, and engaging account about an unlikely veteran.